As a native New Yorker, I stand ashamed of my state legislators and the massive, unconscionable expansions made to abortion laws in the state. Every Christian and secular pro-life advocate mourns the hard-hearted glee demonstrated in Albany with the swift and gleeful passage of the so-called Reproductive Health Act. In an excellent interview with Faithwire, the owner of an upstate bookstore owned up to the brave stand he took in response to the RHA's passing earlier in the week. Jon Speed owns The Book Scout in Syracuse. After Governor Andrew Cuomo signed the RHA into law and officially removed all protection for unborn babies from New York's criminal code, Speed couldn't remain silent. As a bookstore owner, he might not have a very big platform or be a highly influential voice, but Speed had something to say about the RHA, and say it he did. 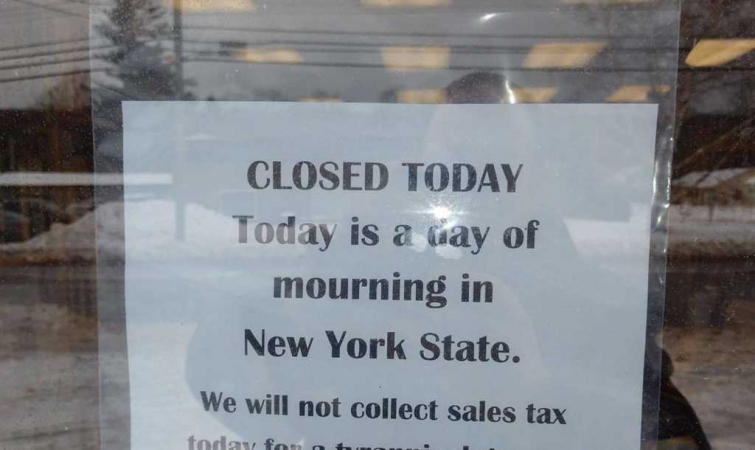 "It is a day of mourning in New York. In honor of the thousands of babies that will die in the years to come under the Reproductive Health Act, we shall not be collecting sales tax on this day. We will resume regular business tomorrow, collecting Sales Tax under duress. End Abortion Now"
We should commend Speed and others like him who aren't afraid to do what they can in defense of the innocent children New York law will no longer protect.